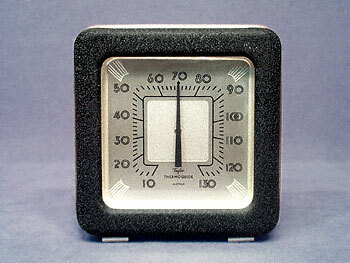 This is a Taylor Thermoguide thermometer. It has a black painted body with a textured finish, and a chrome trim ring running around its edge. It is 4" tall, 4" wide, and 1-5/8" deep. The Thermoguide sits on three feet, two on the bottom front (as seen in the photo), and one centered on the bottom back. It is possible that these feet doubled as slide clips for attachment to something else. The words on the face read "Taylor THERMOGUIDE MAYFAIR ". The brightness at the bottom of the face is glare from our lighting. With the exception of some brassing on the chrome ring, this piece is in excellent condition, with good black paint and a very clean face.